With his eight slithering, wiggling legs this Ooh La La Octopus navigates the chilly waters in Puget Sound in polka dot splendor. 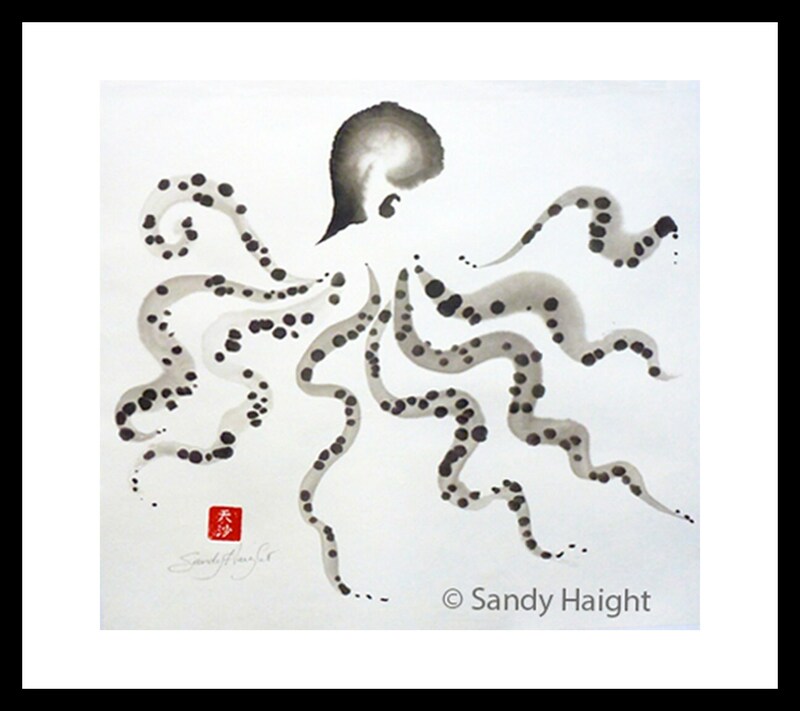 This sumi painting on white rice paper framed and ready to hang and tickle your fancy for years to come. I have several Octopus paintings, each with their own personality. Check them all out and see which your like best! Painted on rice paper with sumi ink, the painting is mounted on masa, a white paper, to flatten it and bring out the richness of the tones, signed with my name and my personal red chop. It's matted in white and framed with a black metal frame, ready to hang to add delight to any room in your home. Artwork comes with a signed Certificate of Authenticity. The photograph is appears bluer than the original which has no background color. (The copyright notice is not part of the product, just protecting use of the image file). This is an original, not a print. Image size 13.5" x 12"
Frame size: 18" x 16"
In 2012 I qualified to be a signature member of the Northwest Watercolor Society (NWWS). This is earned by being juried into a select number of local chapter and international watercolor society shows sponsored by NWWS. The initials now follow my signature on my newer paintings which you can see in the Floralscapes section of this shop.